Pest description and damage Mature bulb mites vary from about 0.02 to 0.03 inch long and have four pairs of legs. Their bodies are shiny, white, somewhat transparent, and smooth with reddish brown appendages. They are usually found in colonies. Their oval shape and sluggish behavior can deceive the human eye into identifying them as eggs. They avoid the light and hide under damaged or diseased tissue. Bulbs infested with bulb mites may rot and fail to produce new growth, or new growth may be off-color, stunted, and distorted. 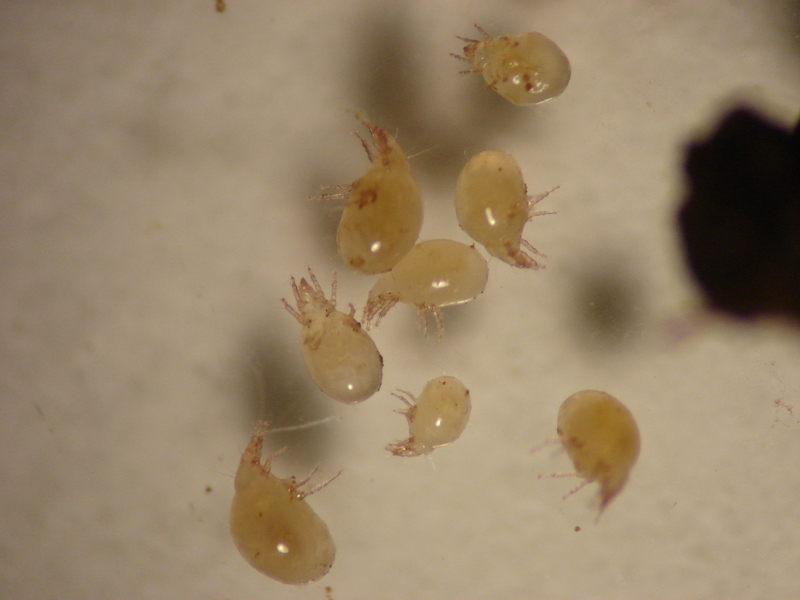 Although the bulb mite is not considered a primary pest of bulbs, it is often responsible for serious losses; the slightest injury to a bulb will allow bulb mites to enter and become established. Once the mites are inside the bulb, they rapidly turn the bulbs into rotten pulp. Injured or bruised bulbs are the most susceptible to damage. Not only do mites destroy bulb tissue, but they also carry fungi and bacteria which often result in additional damage. Millipedes may move into the rotting bulbs which confuses the diagnosis. Bulbs planted too late in the season are often heavily infested and dried out by the time they are planted.